Marsch. Composed by Johann Schrammel. Arranged by Jos van de Braak. Baton Music Orchestral Series. Score only. Duration 3:00. Published by Baton Music (BF.BM642-SCORE). 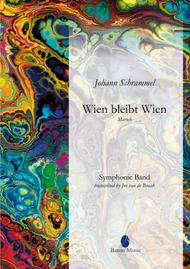 Johann Schrammel (1850 1893) was an Austrian composer and musician. In 1878 he founded with his brother Josef Schrammel and Anton Strohmayer a trio; they were later joined by the clarinettist Georg Danzer to form the famous '' Schrammel Quartet'. By playing very popular Viennese music, the quartet became famous and even nowadays this music is still well known as 'Schrammelmusik'. Johann Schrammel most famous work is undoubtedly the march 'Wien bleibt Wien.